Whoever coined: “You can never judge a book by its cover”, never met Norman Giller. One hundred books? Well In his near-60-year writing career, Giller, a former chief football reporter for the Daily Express, This Is Your Life scriptwriter, and publicist for Muhammad Ali and Frank Bruno – not to mention a regular column for the SJA website – has had more words published than Shakespeare and Dickens managed between them. 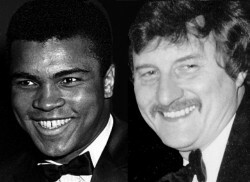 Now he crowns it all with his life story, from the back of the queue in the bomb-blitzed East End – he really did know the Krays, by the way – to front-row seats at some of the most memorable sporting events of the 20th century. But Headlines Deadlines All My Life is an autobiography like no other I have come across. It is a collection of anecdotes set out, decade by decade. Each is rarely more than a page long, so this is a life story told in bite-sized chunks. Inevitably there are hundreds of names you will recognise – Giller first thought of entitling the book “Namedropper” – but, for me, perhaps the most fascinating part of the book is its beginning where “The Kid from Cable Street” tells us about growing up in the area once terrorised by Jack the Ripper, and where in the 1936 Battle of Cable Street his father got in some punches at Oswald Moseley’s racist Blackshirts. Norman – his bitterly disappointed parents were counting on a girl who would have been called Norma – came into an angry world on April 18, 1940, in a cramped two-bedroomed ground-floor flat in the heart of London’s docks, with the Blitz on its way. For Giller, five years of war meant taking his first footsteps in a farm in idyllic north Devonshire, to where he and his brothers, George and Alan, and their mum, Winifred, had been evacuated. His father, George Giller, was fighting the Germans in Yorkshire, where he was in the Catering Corps. When Norman and his brothers returned to the East End and reunited with their father, George was to Norman just a stranger in khaki who he had seen about half a dozen times in the intervening years. When he was sober, George Giller could charm the birds off the trees. When he was drunk – which was every weekend – he could be a wife-beater. The man who made his living as a bookie’s runner and pub pianist seems to have induced love and fear in equal measure. For Norman, it amounted to an unsympathetic education in the – cliché alert – University of Life. There were also plenty of positives. The 1948 London Olympics, for instance, gave Norman Giller an inside-view of the Games because a near neighbour, Frank Turner, was captain of the British gymnastics team. Gathering information from newspapers and the wireless, the eight-year-old produced highlight reports on the Olympics for his Chapman Street Junior School. 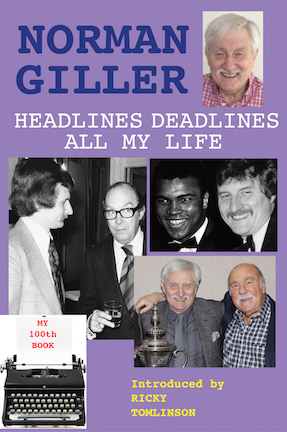 Norman Giller was on his way to becoming a Fleet Street sports journalist. After leaving Raine’s Foundation Grammar School in 1955, he took a job as a copy boy on the London Evening News – it was either that or a working life spent as a Thames lighterman – and at the age of 15 he became a card-carrying member of the National Association of Operative Printers and Assistants (remember NATSOPA?). Another fully rounded education: it meant working as a dogsbody in almost every department of a newspaper, running sheets of hurriedly typed copy from reporters to sub-editors, then to Linotype operators; as a block boy carrying metal photo bases to the printing stone; rushing layout pages from the art desk; collecting photographs from the agencies up the street; and – best of all – working on the sports desk as an unpaid statistician. Eventually, Giller sent off applications to six local editors. It was the Stratford Express that replied with a job offer as a journalist on the union minimum wage of £6 a week. Giller switched from NATSOPA to the NUJ, and never looked back. Well, actually, he looks back a lot, but never in anger. From that the point, Headlines Deadlines All My Life is a roller-coaster of stories, a skip-and-dip read of tales culled from half a century of mixing with – as the author puts it – celebrities, champions, contenders and clowns. The general public will know most of the names. Retired sports writers will know them all. Indeed, they may find their own here. It is largely a funny book, but also one that is tinged with great sadnesses – the death of brother Alan, aged 11, from a kidney disease; and, by cruel coincidence, the loss of Eileen, Norman’s wife of 45 years, also to renal failure. This is a unique tale told in a unique way. The old Fleet Street fox may well have stumbled on a new way to write an autobiography. It is certainly one that I enjoyed, shall re-read, and then read again.